1) buy 1 get 1 free at HModine. Buy any item and get the 2nd FREE of equal or lesser value! 2) clearance business card holders at KreativeKarryAlls. 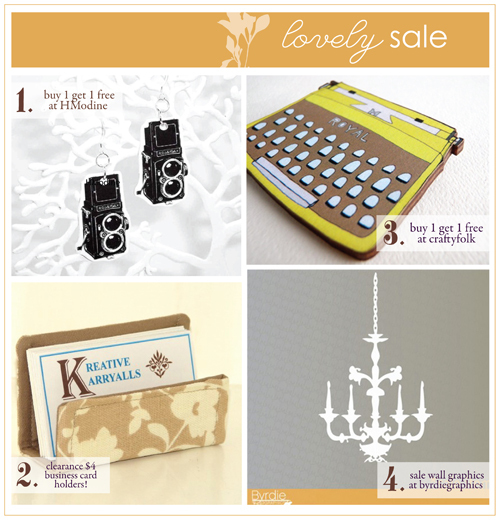 3) buy 1 get 1 free at craftyfolk. 4) huge sale on wall graphics at byrdiegraphics. this shop has 30+ cute wall graphics on sale from $3-$6! grab a few for you or a friend. ps: if you own an etsy shop and are having an amazing sale like the above in the near future, please email me with your shop link + sale to be considered for future sale postings. Oooh gotta love deals! Thanks for sharing!